In recent times not a whole lot of thought went in to how you would position your newborn to sleep and play. This was until science began to see a correlation between infant posture and SIDS. In America, SIDS is still the leading cause of infant deaths today. Incorrect infant posture can also lead to complications later in life. To a mother there is nothing more important than ensuring their little one is safe. This article will outline safe infant positioning and posture techniques that parents and caregivers of an infant should implement on a day to day basis. The abbreviation ‘SIDS‘ refers to Sudden Infant Death Syndrome. Sometimes known as ‘Cot Death’, SIDS is the unexplained death of an over all healthy infant (under the age of one). SIDS is associated with an extended period of sleep and those aged 2 to 4 months are at the most risk. Although no practices can completely rule out the risk of SIDS, the chances of it affecting your newborn can be reduced dramatically by strictly following safe sleeping practices. When putting your infant to sleep always ensure their cot is free of anything that could interrupt their normal breathing patterns. In addition, always position them safely on their back. Always avoid the following as these are risk factors of SIDS. Research has revealed some correlation between safe sleeping and a decrease in SIDS. The first image shows the correct sleeping position for a newborn, while the second shows a potentially dangerous sleeping position. Unless you have done your research you may be surprised to read that babies are often born with a subtle difference between their left and right sides. As a baby grows and stretches these asymmetries disappear. That is, if you give them the ability to stretch often. While holding devices such as a capsule, bouncer or swing often have a calming effect on a newborn, extended periods of time in these devices can prevent your newborn from being able to stretch out their asymmetries. Furthermore, incorrect positioning of an infant places them at a higher risk of SIDS as mentioned above. First time mothers often feel nervous when picking up their newborn for the first time. Holding a newborn should not feel awkward or uncomfortable for either the mother or the baby. Newborn babies have little neck control so it is vital that when you hold them you support his or her neck the entire time. This may be in the form of cradling their head on your forearm, on your shoulder or supporting their head with your hands. 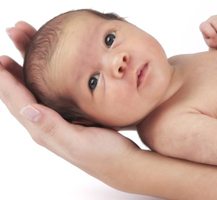 The following images demonstrate safe ways to hold a newborn baby so that their neck is adequately supported. Safely positioning your newborn baby in their bassinet or crib works to prevent SIDS (sudden infant death syndrome). Place your Infant to Sleep on their Back. Infants placed on their back to sleep are at less risk of SIDS compared to those who have been placed on their side or stomach. Always place babies feet towards the end of the cot. This prevents them from being able to pull loose bedding over there face. Sleeping suits are preferred bedding as the baby cannot pull it up over their head. Always purchase bedding based on safety rather than appearance. Your infants mattress should be firm. If you choose to purchase a second hand crib, research to ensure it meets the current standards laid out within your country. Research over the past few years has proven a link between second hand smoke and SIDS. Pregnant women who smoke also increase their babies chances of falling risk to SIDS. Do not co-sleep although ensure you keep your infant close by, preferably in the same room. Soft bedding such as cot bumpers and make shift beds such as lounges pose a risk to your infant. Their mattress should be firm to allow them a direct breathing channel if they were to roll in their sleep. Ensure that your newborn is warm although avoid overheating. Place a room thermometer in your infants bedroom allows you to tract the temperature and dress them accordingly. Ensure any careers of your infant know how to correctly position them for play and sleep. 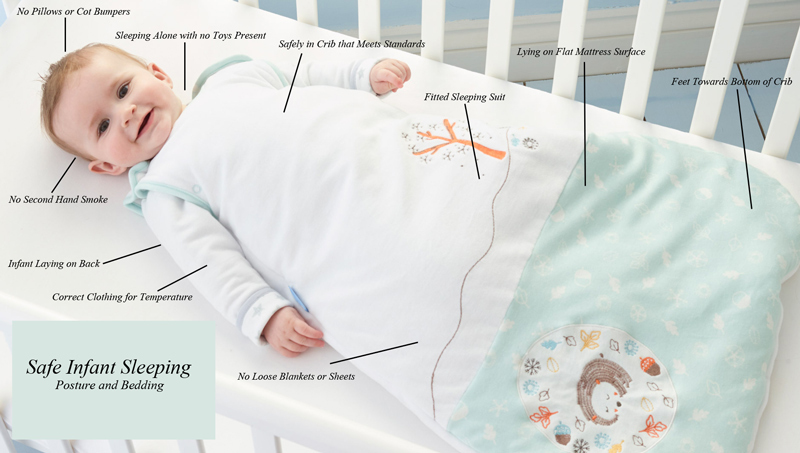 The graphic below demonstrates a safe sleeping environment for an infant in terms of posture and bedding arrangements. While it is important to make bath time fun for your infant, you should always do so in a safe manor. Safely positioning your baby in their bath with correct posture prevents them from swallowing water or worse drowning. Purchasing a small bath tub for your newborn and a newborn bath net allows you to position them for bath time with ease. Ensure the water is at an appropriate temperature and using one hand beneath your infants bottom and the other supporting their shoulders and neck, lower them into the bath. Once your infant is laying on their bathing net, you can use the hand that was beneath their bottom to gently wash them. Ensure that you maintain support behind their neck. A bath seat should not be used until your baby can confidently sit upright without assistance. It is important to encourage good posture from an early age. When speaking of posture in terms of an infant there are some common mistakes mothers make that can impact their little one’s posture later in life. One of the most common mistakes that can affect your child’s posture is attempting to sit them upright before they are ready. Forcing your baby to sit upright before they are ready can actually delay them to sit up on their own. Time poor mothers often relay on baby carriers and seats too often. Keeping your infant in a swing, bouncer or capsule keeps your baby in a C curve position. In doing this, the cervical and lumbar spine are not able to stretch and in turn develop correctly. Tummy time for infants should always be encouraged. Many babies tend to hate being on their stomach although it is important to persist with regular tummy time. Tummy time strengthens an infants muscles and in turn allows them to reach milestones such as crawling, rolling and sitting. Using carrier devices should always be used in moderation with the same amount of tummy time each day. For instance, if your infant is in his capsule for half and hour, half an hour of tummy time should be enjoyed. A safe infant bath is important to ensure your babies posture is not compromised. Further more, having inbuilt support actually prevents the carer from constantly having to lean over and risk their own posture. 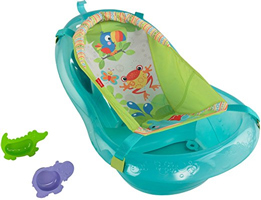 The Fisher Price Baby Bath Tub with Inbuilt Support for newborns until your infant can confidently sit without assistance. Tummy time is an important activity that should be encouraged regularly. A soft but firm mat for tummy time will provide your infant with the comfort and support they need to work their tiny muscles. 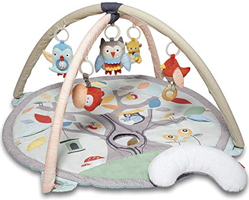 The Skip Hop Activity Gym and Play Mat for tummy time and play. This is a padded play mat that also has lots of visually appealing colors and graphics. Sleeping suits are a safer alternative compared to sheets and blankets. Unlike a blanket, sleeping suits cannot be pulled up over a babies face. 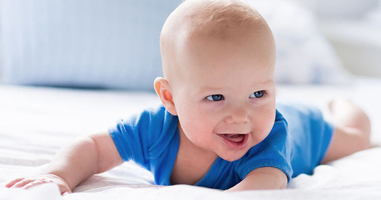 Loose blankets can potentially interfere with an infants normal breathing. 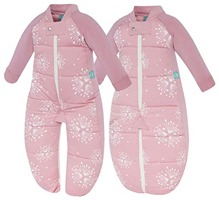 The Ergo Pouch Sleep Suit for infants aged 2 months plus. This sleep suit will not only keep your infant warm although doesn’t restrict their normal movements like swaddles and wraps.